While serving as Greece’s Finance Minister, Dr. Yanis Varoufakis made every attempt to negotiate an acceptable bailout for Greece while both the world and his countrymen waited with taut nerves. At press conferences, he spoke with the confidence of a winner, even though his country was battling for its financial and political survival. His efforts preceded the massive migration of war-ravaged Syrian migrants to Greek shores. The country already teetered on both bankruptcy and the loss of its standing as a member of the European Union. The fate of a nation hinged on the destiny Varoufakis could carve with his crucial intervention. The Greek people voted “NO!” to surrendering before more European Union demands for excruciating austerity and a loss of sovereignty. Their vote was consistent with Varoufakis’ financial, political and moral position. Soon afterward, with European Union pressure mounting and social despair on the rise, Prime Minister Alexis Tsipras informed Varoufakis that he was taking the side of the European Union rather than what he saw as suicidal defiance. Varoufakis tendered his resignation. He soon observed from a distance how his Prime Minister buckled under subsequent negotiations for further indebtedness coupled with devastating austerity measures rendering the nation vulnerable to incipient corruption while incrementally weakening the country’s sovereignty. Varoufakis spoke at the Unitarian Church in Pasadena, California, in April this year to an audience hosted by the progressive Los Angeles-based radio station KPFK 97.9 FM. It is his unrelenting faith in people that inspired Varoufakis, the academic, to play a role in politics by becoming a member of Parliament, a threshold he crossed receiving the highest percentage of voter support for any new member. While in public service, Varoufakis distinguished himself as a principled maverick in the stodgy world of international finance, standing as proudly as David before the Goliath of European institutions that intended to further humiliate Greece into subservience and indignity. His presence of mind in trying times beckoned audiences, who listened intently to his terse and positive remarks. His gravitas fueled hope among his people and put psychological pressure on potential lenders during his short but conflict-riddled five months in office. Greek pensioners, youths, immigrants and the very poor rallied in support of Varoufakis, a man with impeccable intellectual credentials but untested politically. His unwavering commitment to democracy had an impact on the world and was bolstered by his rock-star image and blunt-speak. He was intent on preventing Greece from falling prey—yet again—to the financial powerhouses of Europe with the U.S.-led neoliberal corporatist theology hovering in the background. As things stood in early 2015, the European Union austerity logic matched its threat to compel a “Grexit” from the European Union. The comparison takes me to the Americas. Varoufakis’ criticism of the “Global Minotaur,” meaning the unquenchable U.S. hunger for profits and its penchant for international control of weaker nations, makes me think of Puerto Rico’s near bankruptcy under external debt pressure. It is only that Puerto Rico’s ambiguous sovereignty has already been mortgaged to the United States. Even so, the Latin American island’s population—as it is the case with Greece—is as deserving of financial dignity as any industrialized lending nation. As a professor of economic theory and political economy, his views on economic integrity, democracy and sovereignty have become enormously relevant for nations large and small. The leading negotiators for the “Troika” (representatives for the European Commission, the European Central Bank and the International Monetary Fund) articulated one position before the TV cameras, Varoufakis told the Pasadena audience, but privately agreed with his analysis of the crisis and his suggestions for a solution they did not dare accept, lest their careers be imperiled. “The strong and mighty used tanks in 1967. Now they use the banks to affect the poor and migrants. They blackmailed the little people,” Varoufakis said in his address. “European capitalism is utterly divided,” added the unlikely politician. Prepared to face the consequences of his convictions, he is undeterred. “The opposition wants to try me for high treason for opposing the closure of the banks. It would be an honor and a privilege, to end up in prison,” he confessed. It is easy to imagine him engaged with people in honest conversation and debate, surrounded by his fellow Greek citizens in what he calls “Athen’s Revolution Square.” I listened to him distill complex financial and economic issues into clear terms. His unassailable populist spirit was not only evident but refreshing. Varoufakis fought valiantly to mitigate the effects of a humiliating debt crisis. He stormed the arena of international affairs fully aware of his country’s leading role in the development of western civilization. In his ministerial capacity, he embodied the warrior-statesman archetype associated with the pinnacle of the classical period in Greek history and the birth of democracy. A worthy heir to this heritage, he carried out his duties with unflinching dignity and resolve. In the spirit of Euripedes’ play, Ion, an allegory about a truth-telling episode during a constitutional crisis in the post-Pericles period of Athens, Varoufakis bravely upholds the truth-teller task (a right and duty intrinsic to the exercise of power) in the realm of finance politics. Varoufakis is currently traveling throughout Europe on a mission to reinvigorate economic models and democratic structures. He argues that policy-making should consider social needs and circumstances. A humanistic approach to lending rules, he says, is vital to rescuing the European Union from its current slide into disintegration. If he is contemplating a return to public service, he conveys the impression that he is well prepared for governing without the weighty moat of hubris that so many other leaders have shielded themselves with in their role as rulers. Varoufakis may be one of the very few willing to serve the individual and collective sovereignty, not only of his fellow citizens, but of people everywhere. 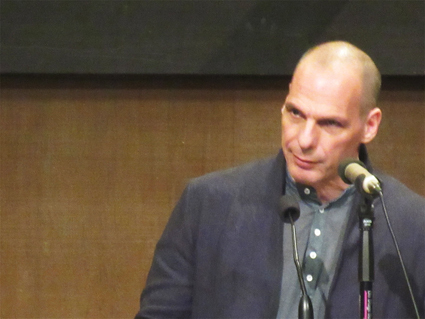 At the Pasadena presentation, I saw in Varoufakis a man with a self-confident gaze. As we shook hands, I said, “You are the hope of Europe.” I believe people around the globe might agree with me. William Alexander Yankes is a PhD student in Latin American literature at the University of California, Irvine.